Christoph Gielen is a photographer born in Germany but currently lives in New York. 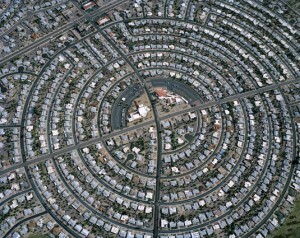 He has been taking pictures of landscapes in America, particularly pictures of urban sprawl. These photos (or aerial studies) are a look at land use in American and are meant to explore how art and the environment relate. These photos are meant to examine and reconsider the way we are designing the built environment. He understands that the way we are currently building suburbia is not sustainable and this type of development needs to stop.